Children will love seeing the shapes "hide" as they locate the correctly shaped opening, drop in the shapes, and then "seek" out the pieces to begin the fun once again! 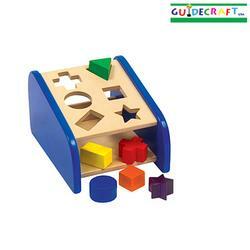 Develops geometric recognition, counting, and shape-sorting skills. Improve fine-motor skills Sturdy wooden construction with rounded corners and smooth edges, safe non-toxic paints with a clear finish. Raised base accomodates floor or tabletop play.